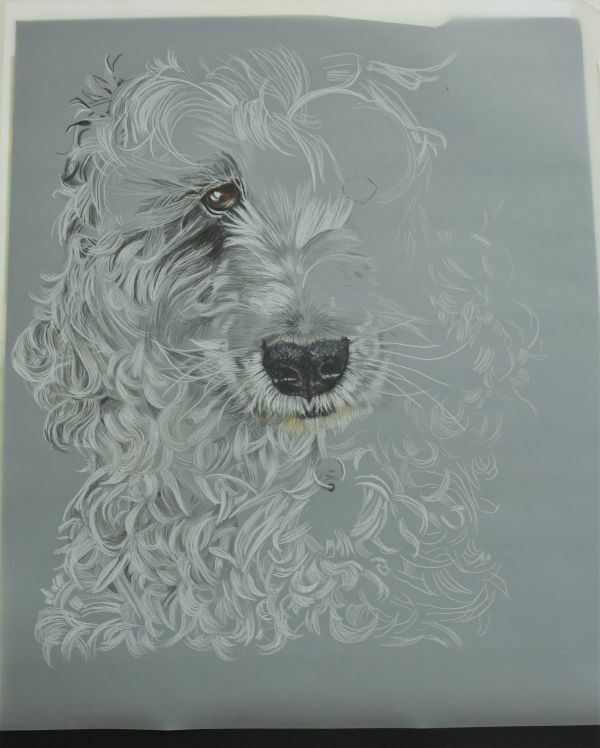 Pencilpix by Sue Clinker: 09/08: CURLY CHALLENGE! I started work on this yesterday and will get a little more done this afternoon. I fancied a change from humans and what could be more challenging than all these glorious curls. I had the pleasure of meeting this lovely character, Spock, earlier this year. He belongs to a fellow coloured pencil artist who lives near me and whose work I collected from the London Gallery and delivered to his house when the Exhibition finished in May. I always have my camera with me and couldn't resist taking a few pictures ... I think the photos were taken the day before Spock had an appointment with the dog groomer to get his curls clipped short. I'm working in coloured pencils (Polychromos) on drafting film with a black backing sheet and I'm making a few adjustments to the ref. photo as I want to reveal Spock's left eye (on the right side as we look at him) which is totally hidden by a lock of white hair which had fallen across his face.